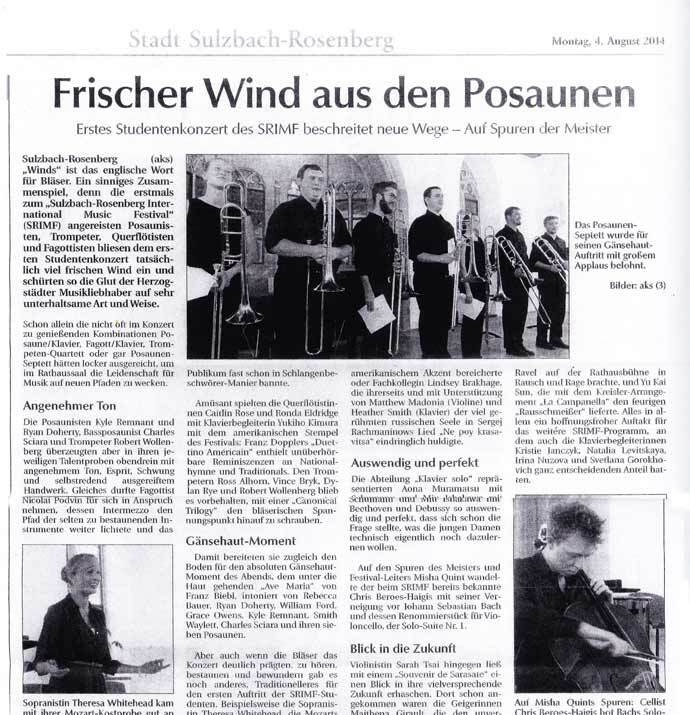 Sulzbach-Rosenberg (aks). In English, they sometimes call horns 'winds.' 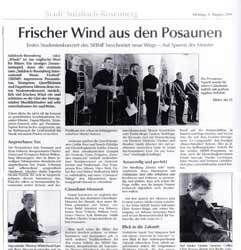 The expression is a fitting one: the trumpeters, flutists and bassoonists who came this year for the first time to the Sulzbach-Rosenberg International Music Festival (SRIMF) blew a fresh wind into the first student concert, stoking the excitement of music-lovers of the ducal city in a most entertaining way. The uncommon combinations alone – trombone/piano, bassoon/piano, trumpet quartets and even a trombone septet – would have been more than enough to awaken passions in the Town Hall in new musical directions. The trombonists Kyle Remnant and Ryan Doherty, bass trombonist Charles Sciara and trumpeter Robert Wollenberg, were all convincing in their respective tests of talent, performing with pleasing tone, spirit, swing and self-evidently mature technique. Bassoonist Nicolai Podvin, who forged ahead on the path of the seldom seen instruments, could claim the same, capturing the audience's rapt attention with his Intermezzo. Flutists Caitlin Rose and Ronda Eldridge, accompanied by Yukiho Kimura, played with the festival's American character amusingly: Franz Doppler's "Duetino Américain!" contained unmissable reminiscences of the national anthem and other traditional songs. Then it was up to trumpet-players Ross Alhorn, Vince Bryk, Dylan Rye and Robert Wollenberg to raise the horn-playing to the next level with a "Canonical Trio." Their performance paved the way for the evening's big moment, which gave the audiences goosebumps: Franz Biebl's "Ave Maria," intoned by Rebecca Bauer, Ryan Doherty William Ford, Grace Owens, Kyle Remnant, Smith Waylett, Charles Sciara and their seven trombones. Although the horns clearly set the tone for the evening, more traditional repertoire for the festival's first student concert was also waiting to be heard and admired. For example, soprano Theresa Whitehead, whose charming American accent added zest to Mozart's "Bester Jüngling," or her peer, Lindsey Brakhage, who for her part, supported by Matthew Madonia (violin) and Heather Smith (piano), paid homage to the rightly famous Russian soul of Rachmaninov's song "Ne poy krasavitsa." For the piano solo section, Aona Muramatsu presented Schumann and Miu Ishikawa Beethoven and Debussy so perfectly and by memory, that one could only ask oneself what, technically, these young women still hoped to learn. Following in the footsteps of the master, festival director Misha Quint, Chris Beroes-Haigis, a familiar face at SRIMF, performed Bach's showpiece for cello, the Solo Suite, Nr. 1. Violinist Sarah Tsai, with her "Souvenir de Sarasate," gave a peek into her very promising future. Violinists Maïthéna Girault, who filled Ravel's immortal "Tzigane" with an intoxicating rage, and Yu Kai Sun, who brought the concert to a fiery close with Kreisler's arrangement of "La Campanella," however, had already arrived there. All in all, a very promising start to this year's SRIMF program, to which accompanists Kristie Janczyk, Natalia Levitskaya, Irina Nuzova and Svetlana Gorokhovich made a significant contribution.